A pale pink waterlily blooms in this painting of koi. 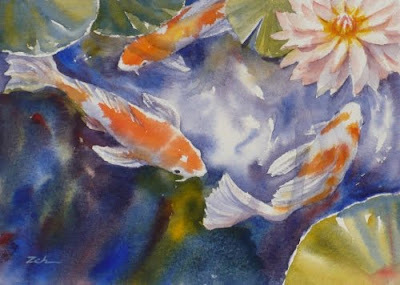 As in all my koi paintings, I use a three-color process in this piece. The three primary colors - red yellow and blue - are freely allowed to flow into each other creating the secondary hues of orange, green and purple. This makes for a dynamic painting! See more of my art for sale at zehoriginalart.com. Thanks for stopping by today!